I have gone back and forth about my thoughts of Dave Schmidt for years. Honestly he is the reason that I am in dinarland. His article 3 1/2 years ago convinced me to jump in. However, very quickly he went into territories that just didn’t feel good. I have always been a strong believer in my intuition, and he did some things that just didn’t agree with me. Recently I did sign up for his group, mainly because he wasn’t asking for anything up front, yes eventually you are supposed to submit your currency to him for redemption, but until that day comes I am viewing it as a backup plan. I am thinking that the public release will come before or at the same time as his group is starting, so it will be a moot point. Everything he has said or done has all been unprovable, like most in dinarland, but with this new photo evidence there is something else. I am a photographer and I know that every digital photo contains EXIF metadata that provides all kinds of info: camera, date, exposure, software used, even location if it’s been geotagged. 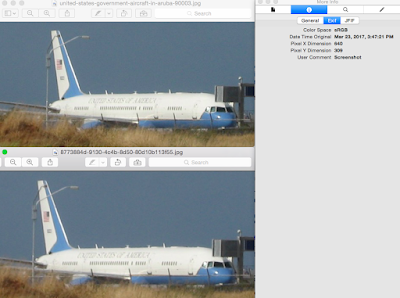 I pulled up the two photos in question (one from the Aruba website, and the one included in Dave’s email) and looked at the EXIF data for both. The photo on the Aruba site seems to have all the credible EXIF data included, a date of 2008, and photoshop version CS3 which is correct for that time, even a camera model appropriate for that time as well. What doesn’t add up is the fact that the EXIF for the photo in Dave’s email has very little data, in fact, it even says that it is a screenshot. The resolution may be bigger for his version, but you can clearly see that the quality is not as good as the Aruba one. Another thing, there is a black line at the very top of Dave’s copy, that is not there in the Aruba version, indicating that it very well could be a screenshot that was not perfectly aligned. If you click on the photo on the Aruba site, it will be displayed by itself on a black background. As you probably saw, Dave responded to the claims saying the photo had been doctored and this was all a ploy to discredit him. 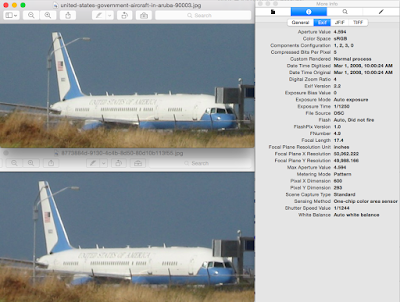 EXIF data can be easily manipulated, however, there is one flaw in his story. If Dave is correct in that the Aruba site has taken his photo and manipulated the metadata to prove it is a very old photo, then why doesn’t Dave’s copy have all of the same exposure data, with only a different date, camera and software? Why does Dave’s copy clearly say that it is a screenshot? I am certainly not trying to discredit Dave, I do appreciate that he is the only person in dinarland that is not anonymous, and that goes a very long way towards his credibility. I am only pointing out that Dave’s sources are not what they seem, and he may be misled by his sources. If anything he is being discredited by the person that gave him the photo, not anyone putting the photo on a site claiming it’s old. I feel that because Dave is not anonymous he is targeted more often than not. I am not suggesting that everything he says is a deception, but that he himself is likely being deceived by some of his sources. Lets not throw out the baby with the bathwater. I am merely posting this in an effort of transparency, because I feel that dinarland should know that Dave is being deceived, and to please follow your own guidance as to who and what to believe. I have included screenshots of the EXIF data in question, the top photo is the one from the Aruba site, and the bottom photo is the one from Dave’s email.